The gym is supposed to be a place where you can go and relieve all of the day’s tension. It gives you a break from your own thoughts and an escape from the real world. It’s a great place to be… until it’s not. The people who infiltrate this space can either be great or your worst nightmare and, unfortunately, when the latter is the case, it becomes your personal hell. Who are the worst people you encounter while getting your work out on? Well, here are the 7 people at the gym ruining your workout. Favorite Exercises: Lifting, Giving high fives. 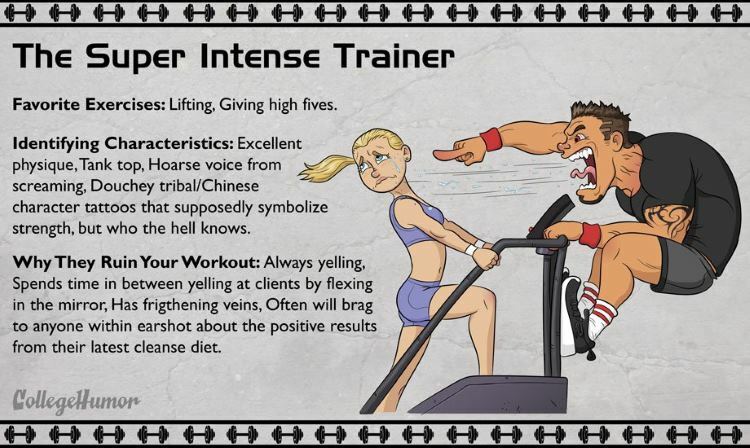 Identifying Characteristics: Excellent physique,Tank top, Hoarse voice from screaming, Douchey tribal/Chinese character tattoos that supposedly symbolize strength, but who the hell knows. Why They Ruin Your Workout: Always yelling, Spends time in between yelling at clients by flexing in the mirror, Has frigthening veins, Often will brag to anyone within earshot about the positive results from their latest cleanse diet. Favorite Exercises: Yoga (obviously), Sometimes capoeira. 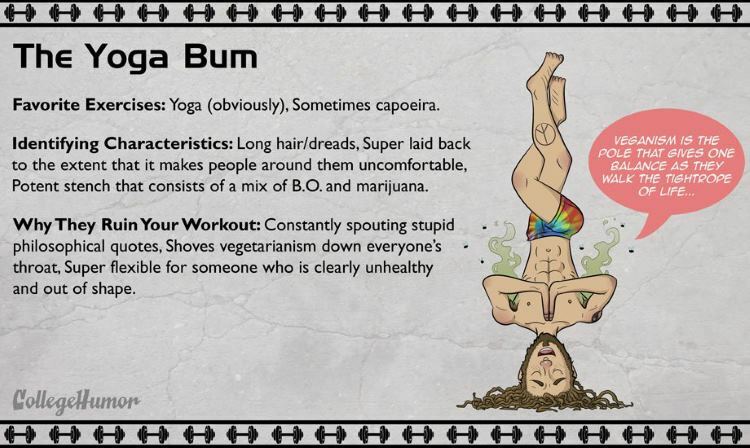 Identifying Characteristics: Long hair/dreads, Super laid back to the extent that it makes people around them uncomfortable, Potent stench that consists of a mix of B.O. and marijuana. Why They Ruin Your Workout: Constantly spouting stupid . philosophical quotes. Shoves vegetarianism down everyone’s • throat, Super flexible for someone who is clearly unhealthy and out of shape. Favorite Exercise: Whatever’s hardest for them. 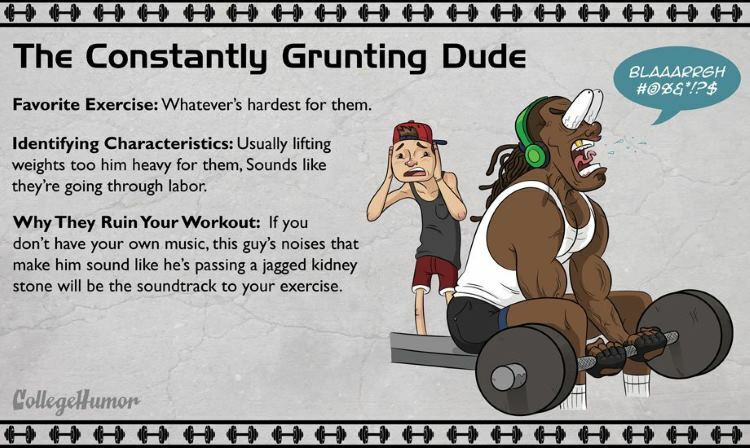 Identifying Characteristics: Usually lifting weights too him heavy for them, Sounds like they’re going through labor. 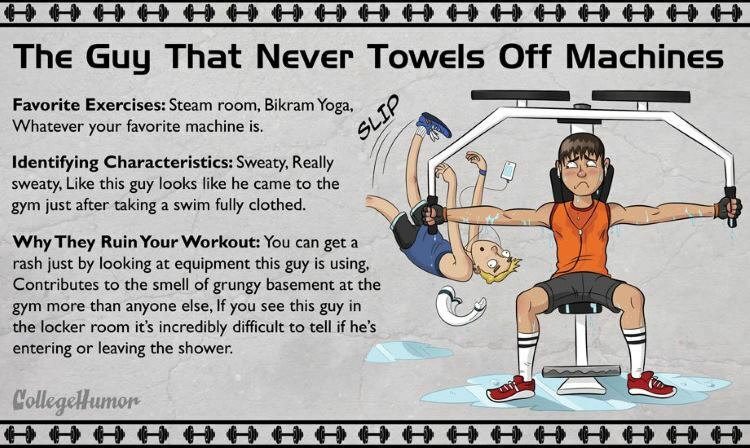 Favorite Exercises: Steam room, Bikram Yoga, Whatever your favorite machine is. Identifying Characteristics: Sweaty, Really sweaty, Like this guy looks like he came to the gym just after taking a swim fully clothed. 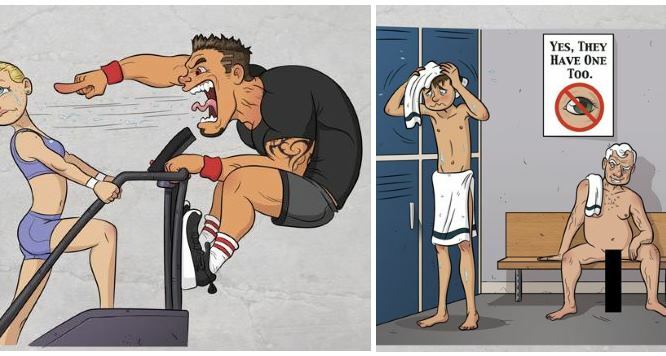 Why They Ruin Your Workout: You can get a rash just by looking at equipment this guy is using, Contributes to the smell of grungy basement at the gym more than anyone else, If you see this guy in the locker room it’s incredibly difficult to tell if he’s entering or leaving the shower. 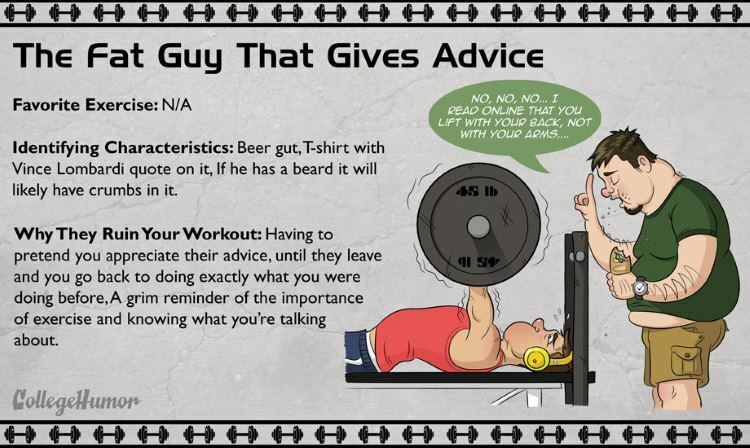 Identifying Characteristics: Beer gut,T-shirt with Vince Lombardi quote on it, If he has a beard it will likely have crumbs in it. Favorite Exercises: Photography, Fashion debates with other seine takers. Identifying Characteristics: Always holding their phone, Makeup, Needlessly expensive and brightly colored clothes. 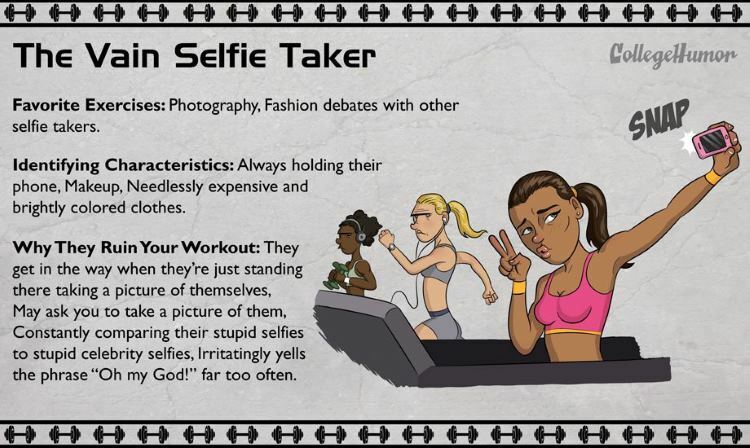 Why They Ruin Your Workout: They get in the way when they’re just standing there taking a picture of themselves, May ask you to take a picture of them, Constantly comparing their stupid selfies to stupid celebrity selfies, Irritatingly yells the phrase “Oh my God!” far too often. Identifying Characteristics: Doesn’t work out, Almost always sitting in the locker room naked. Never enters another part of the gym, Psychotic glint in the eyes. 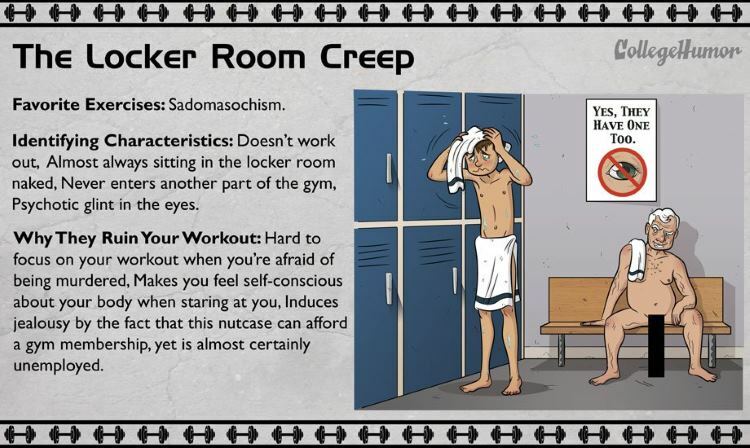 Why They Ruin Your Workout: Hard to focus on your workout when you’re afraid of being murdered, Makes you feel self-conscious about your body when staring at you, Induces jealousy by the fact that this nutcase can afford a gym membership, yet is almost certainly unemployed.